Past actions have consequences. We experience it in our everyday life all the time and, while we might not always be conscious of it, we do notice when our pants fit tighter after having too much junk food. When dealing with the repercussions of past actions like too much junk food, we stop, take note, and adjust for a more desired outcome. Sadly in this week’s episode of Riverdale, some bad seeds are still being sown while others have come to harvest. Newly appointed errand boy, Archie Andrews, is running all over town for Hiram Lodge as part of his new “internship” with Lodge Industries. The big to-do happening at the moment is Veronica’s upcoming Confirmation ceremony. It’s a big deal with all kinds of family and business associates attending and while Archie doesn’t see this as a big thing, FBI guy would tend to disagree. 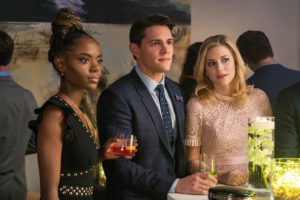 FBI guy wants Archie to act as a spy during the ceremony, but Archie is so not on board seeing as he wants to be there for his girlfriend instead of being there as a spy. It’s a shame that Archie doesn’t really want to get his hands dirty in this because the sooner he can get the FBI guy something, the sooner the whole thing is over. 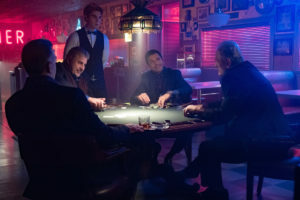 Archie should have opted to wear a wire while he was slinging drinks and cutting cigars at Hiram’s poker game at Pop’s but, again, he chickened out. At least Archie knows Hiram was impressed with the initiative he took in regards to Nick St. Clair (you know, the guy who almost raped Veronica) because otherwise, he wouldn’t be Hiram’s right-hand guy. It’s also a good thing Archie was there because he overheard a plot to overthrow Hiram after his daughter’s ceremony. Archie doesn’t spill the beans just yet, because it’s always nice to have an ace in your back pocket. On Veronica’s side of life, she’s having reservations about having daddy bring Archie into the fold of the family business. She’s clearly struggling to see things clearly even after going to confession where she admits to lying and leading someone she cares about down an unrighteous path. To be honest, I’m not really sure when Veronica went from self-righteous to fully on board with nefarious dealings, but at least she has enough of a conscious to see that it’s not exactly right. She does manage to make it through her Confirmation ceremony but decides that Archie is her shining beacon and she doesn’t want him brought in on the family business. 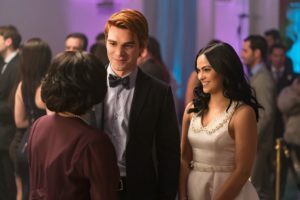 During the after-party, Archie decides to tell Hiram about the plot to overthrow him and, thankfully, nothing crazy happens at the party. It’s only when Archie gets home and talks to FBI guy that he realizes that Hiram had the guy killed. Archie plays dumb about knowing how or why that could have happened. Meanwhile, seeds of unrest are brewing in the Serpent camp, no thanks in part due to Sheriff Keller continuing to harass everyone about the missing head of the General Pickens’ statue. If the constant harassment wasn’t bad enough, Sheriff Keller turns up again with an eviction notice for everyone in the trailer park. This order comes from Mayor McCoy and seeing as how not everyone is current with their rent, all tenants have to be out in 14 days. Does that seem a little fishy to you? Yeah, me too. Jughead also thinks it’s all a little silly and confronts the Mayor about the whole deal. While she puts on a good front, Jughead deduces that Mayor McCoy is having her strings pulled by someone and isn’t acting of her own free will. If all that wasn’t bad enough, Penny Peabody showed up thanks to Tall Boy. She can help the Serpents with their eviction problem, but she’s out for blood after what Jughead did to her and the whole thing will be put to a vote: either Penny stays or Jughead stays. Thankfully, this whole mess causes Jughead to reach out to Betty about everything and, with the luck that they have together, they manage to secure the missing bronze statue head just before the vote. Turns out it was dumped by some tall guy wearing a Serpent jacket. Tall Boy admits to helping Hiram cause a little mayhem and sow seeds of unrest within the Serpents with the ultimate goal of getting rid of FP, Jughead’s dad. Sadly, Tall Boy thought the Serpents were getting soft under FP and that a little mutiny was a best course of action. It may have worked, but now you’re disowned and kicked out. I don’t think anyone can say they feel bad for Tall Boy. Betty’s being a naughty girl online. Dark Betty lives, but how much will it bleed into normal Betty’s life? Chic seems to have secured a job working concessions at the Bijou but I can’t help but wonder why the interview took place at his home and why he’s only wearing a bathrobe? There was way more blowback from Jughead’s article about General Pickens than anticipated and, sadly, it lead to Jughead and Betty being suspended from the school paper. Jughead and Betty might be back together again?! Or, at the least, they hooked up in Jughead’s trailer. Betty’s father Hal has decided it’s safe to leave a stranger in the house with his wife and child instead of making an effort. It’s a shame because some unsavory looking dude came by looking for Chic and now he’s dead and Betty’s mom, Alice, is cleaning blood off the floor.